Most people know that domestic violence is a violent act against a family member or a current or former intimate partner. In the United States, domestic violence is a legal term that denotes a crime that can lead to arrest and prosecution. However, the term domestic violence doesn’t fully describe what many women experience from either their husband or boyfriend. The word battering has been used to describe the abuse and physical violence used with the specific intent to control an intimate partner’s thoughts, feelings and actions. Unlike the term domestic violence which typically refers to illegal, physical violence, battering is focused on a pattern of abusive and coercive behaviors that will ultimately establish the batterer in a dominant position over their partner. The behaviors will usually include physical violence but in some cases may involve abusive acts like threats, breaking objects, harm to pets, or coercion around money, faith or children. Men who batter women and children believe in power over their families. Those of us who work with men who batter know that our interventions must account for this power or we risk diminishing women and children’s safety. Successfully accounting for his power and the control it gives him requires making it visible to his church, to the victims of his violence and ultimately to him. Women and children who live with battering need those who intervene to understand his entitlement, name his power and create strategies to circumvent the effectiveness of his control. We cannot do this without aligning ourselves with the women and children we aim to protect. For those willing to step forward, this is the challenge. Battering can be physical, sexual, emotional, economic, or psychological actions or threats of actions that influence another person. This includes any behaviors that intimidate, manipulate, humiliate, isolate, frighten, terrorize, coerce, threaten, blame, hurt, injure, or wound someone. Battering or domestic violence can happen in any adult relationship however, the majority of cases in the U.S. involve male use of violence against women. 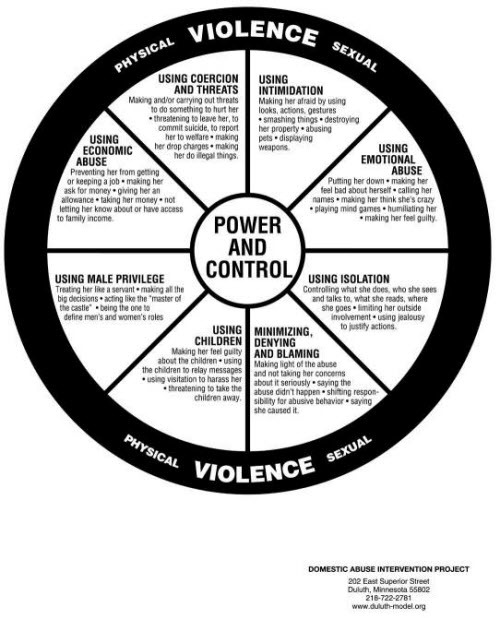 The Power and Control Wheel pictured below was created in the 1980’s by the Domestic Abuse Intervention Programs, Duluth, MN, and women who were battered. The wheel, along with culturally specific variations of it are used throughout the world. The wheel describes the tactics that are used together as a system in violent relationships. These tactics stem from entitled/privileged beliefs which give justification to men to use them, resulting in power and control over their partners. 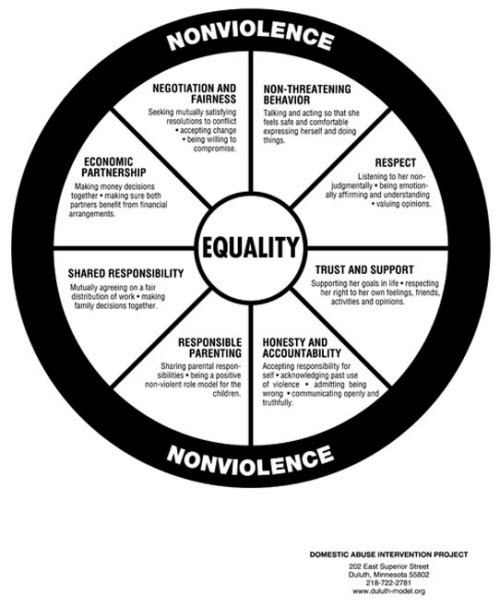 Physical and sexual violence are along the outer rim of the wheel because they reinforce the tactics. Together this system of behaviors along with cultural and social beliefs builds barriers to a woman’s escape. Economic abuse prevents a woman from gaining the financial freedom that could help her escape the violence. Isolation destroys the support system of relatives and friends who might be able to assist her in getting information, support and resources. Threats reinforce the fear she feels and may make the known violence seem safer than the retaliation promised, if she attempts to flee. Sexual abuse is also common, including denial of her right to refuse intimacy through the use of violence and threats. Please see the “Wheel Gallery” at: www.theduluthmodel.org for more information.